Holy expletive Batman! 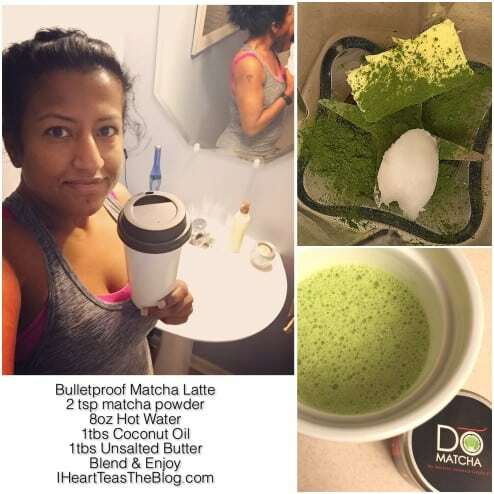 Made my first ever Bulletproof Matcha Latte Friday morning before a very intense strength and cardio class at my gym. It is the only class I’ve ever taken that made me feel as if I were extremely unfit. Sweat pours, heart is pumping, and muscles burning. It was my intention to do myself a little favor and energize and prepare for my workout. I normally just consume carbs and a little protein before a workout but this workout; a beast of a workout, needed something special. So it came to me. I’ve been on a “Bulletproof” kick lately now that I finally fingered out how to make one correctly but most of my concoctions were made using coffee or a variety of different black tea. It made sense that matcha and bulletproof was something that needed to happen. Results: Boom! I felt an almost immediate burst of energy. The key is to make sure along with the latte that you get in some carbs or you’ll find that you may burn out faster. The boost is great because it forces you to push harder in class. You feel invincible and as such you push yourself to your limits. All very good things. Half way through the one hour workout you still to lose the initial jolt of energy and start you utilize the carbohydrate component of your meal. In my case a banana. Not only did I make it through the workout I know I worked harder than ever before. I WILL do this again. If you have ever wondered why people call it “Bulletproof” it is because of the addition of butter and coconut oil. People believe the combination to be so healthy you will “bulletproof.” My only disclaimer is you use REAL ingredients. You’ll want grass feed, organic unsalted butter. Organic Extra Virgin Coconut Oil and high quality Matcha. I used DoMatcha, my favorite for a long time now. If your looking for an all natural, healthy edge for your workout give this a try pre-workout. Plus it is delicious, creamy, and has no added sugar. The matcha provides enough natural sweetness for me. Disclaimer: I am not a doctor, nutritionalist, wizard, shaman, or voodoo priestess. I am only sharing my experiences and opinions based on me and only me. Again, not a professional and only a Guinea pig for my own crazy experiments.